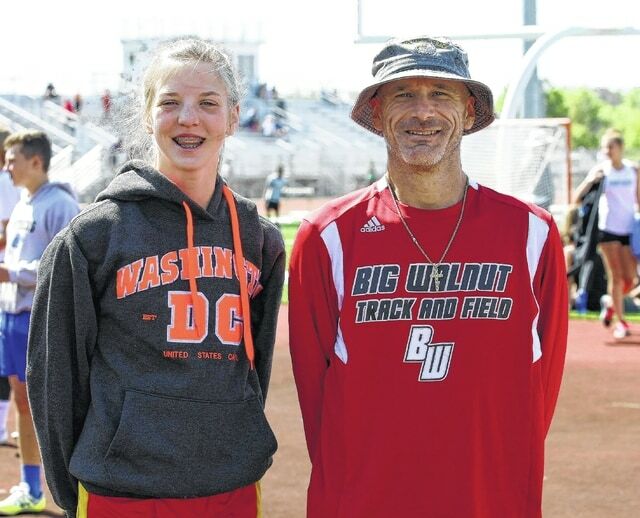 Kaley Rammelsberg and Big Walnut jumps coach Mike Ryder pictured at the 2015 Middle School Track & Field State Championships at Dublin Scioto High School. Big Walnut jumps coach Mike Ryder doesn’t just coach high school student-athletes. Ryder understands that successful high school track teams begin with middle school students learning fundamentals and how to compete. Saturday, May 23, Ryder accompanied his Big Walnut Middle School jumpers to the 10th Annual Middle School Track & Field State Championships held on Saturday, May 23, at Dublin Scioto High School. Kaley Rammelsberg cleared 4 feet, 10 inches in Division I Girls High Jump, tied for 6th Place; Caleb Ramey cleared 5 feet, 2 inches in Division I Boys High Jump for 13th Place; and Zach Westfall cleared 5 feet 4 inches in Division I Boys High Jump for 8th Place. “It was a great day,” Ryder said. “These kids are the future and coming out with two podium spots was a pleasant surprise. Zach had a career best jump and Kaley tied her personal best.